Graphite — traditionally used in steel making — has been swept up in the ongoing electric vehicle (EV) boom. Along with lithium, cobalt, nickel and copper, graphite is one of the runaway metals benefitting from the rapidly expanding use of lithium-ion batteries in electric vehicles (EVs) and energy storage. Graphite is seeing surging demand as it is the main material used in the anode of lithium-ion batteries (LIBs). Today’s company is looking to capitalise on this rising demand of graphite. It has multiple projects in a mining jurisdiction with a 100+ year history that has hosted quality large flake product, combined with low production costs. These projects are located in the island nation of Madagascar — a country with a solid economic outlook — economic growth is forecast to reach 5.1% of GDP in 2018, then average 5.3% each year from 2019 to 2022. Not only that, but Madagascar hosts graphite that’s as good as any in the world. The country already has a well supported mining industry that is host to major established graphite producers including the US$140 billion-capped French Multinational Total SA (EPA:FP), $126 billion Rio Tinto (ASX:RIO), and C$433 million Sherritt International (TSX:S). Notably, one of the company’s Madagascar assets is located within ten kilometres of one of the largest-known and highest quality flake graphite deposits in the world — NextSource Material’s (TSX:NEXT) Molo Graphite Project, which produces premium graphite concentrate that represents up to 3% of the annual global market. Better yet, the grade of the graphite at today’s company’s project is higher than that of Molo. Yet this favourable exploration environment still remains extremely underexplored, leaving plenty of upside for today’s ASX-listed graphite junior. Having secured two promising graphite projects in Madagascar, and listing on the ASX in January, the company is optimally positioning itself to capitalise on the current battery metals boom and ongoing rising demand, fuelled in large part by the rapid roll out of EV’s. It is already progressing well via a systematic and detailed exploration program. 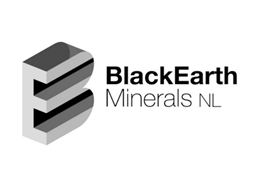 Micro-capped graphite explorer BlackEarth Minerals NL (ASX:BEM) listed on the ASX back in January 2018, raising $5.45 million in the process. 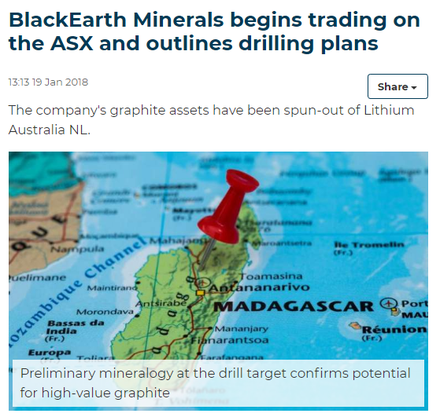 The company was a spin-off of the non-core graphite assets of Lithium Australia (ASX:LIT) — an ASX junior that we have covered for some time here at the Next Mining Boom. The article below summarises the company’s listing. Soon after listing, BEM announced that it would be kicking off an extensive exploration drill program at its 100% owned Maniry Graphite Project in Madagascar. The Maniry Project is one of two graphite projects in Madagascar, the other being the Ianapera Graphite Project. 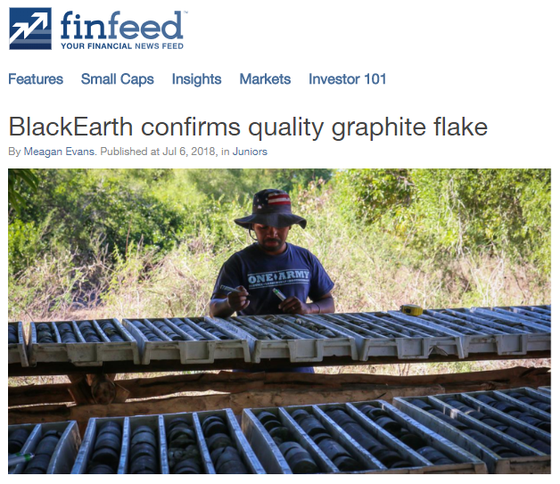 The listing was quickly followed by news that BEM had significantly expanded its graphite and Madagascan expertise. The company appointed OMNI GEOX — an Australian explorations services company that is headed by the experienced exploration geologist, Peter Langsworthy. Langsworthy has worked in Madagascar for over six years and has specific working knowledge of the Maniry Projects, as well as BEM’s second Madagascar graphite project — Ianapera. Managing Director Tom Revy, is a 30-year veteran of the resource sector with specialist expertise in corporate and project development. On top of that, the company’s Manager of Geology, Annick Manfrino, has an extensive background in resource estimation and geostatistics. With over 30 years’ experience Manfrino has advised on, and managed a large number of technical reviews and resource estimations on significant projects worldwide, including in Africa, for the likes of Vale S.A, Xstrata plc (Glencore plc), Fortescue Metals Group Limited and Macraes Mining Company Limited. Before we delve into the nitty gritty of the company’s exploration to date, let’s take a closer look at the projects. 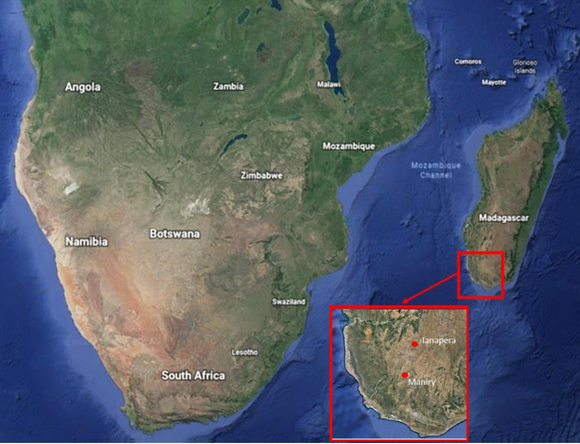 BEM’s Madagascan projects consist of two primary exploration areas: the main Maniry Project in the south, and the Ianapera Project to its north. The Maniry Project is highly prospective for large-scale, high-quality graphite deposits and is currently at an advanced evaluation stage pending additional work to establish an initial Resource, which is expected to be completed mid-2018. Results, from samples taken at Maniry within 50m of surface, have been received including 10m at 10.2% Total Graphitic Carbon (TGC), 12m at 11.6% TGC and 14m at 11.3% TGC. The Ianapera Graphite Project is located within ten kilometres of NextSource Material (TSX:NEXT) Molo graphite deposit and is contained within similar rock sequences. The Molo project has an initial mine life of 30 years, a processing rate of 240,000tpa, producing just over 17,000 tonnes of premium graphite concentrate a year, representing up to 3% of the world market. And BEM’s geologists are confident that the grade at its projects are better than that at Molo — and they should know, having worked on the Molo project as well. Ianapera consists of a series of high-grade graphitic outcrops, up to 800m long and 30m wide. These high-grade near surface exposures have returned grades above 15% total graphitic carbon and lie over the top of a large electrically conductive body, indicating the potential presence of a large graphitic mineralised system. Highly prospective for large-scale, high-quality graphite deposits, Maniry is now at an advanced evaluation stage pending BEM working to establish an initial Resource. A short six weeks after listing BEM commenced its diamond drilling program on the Maniry Project. 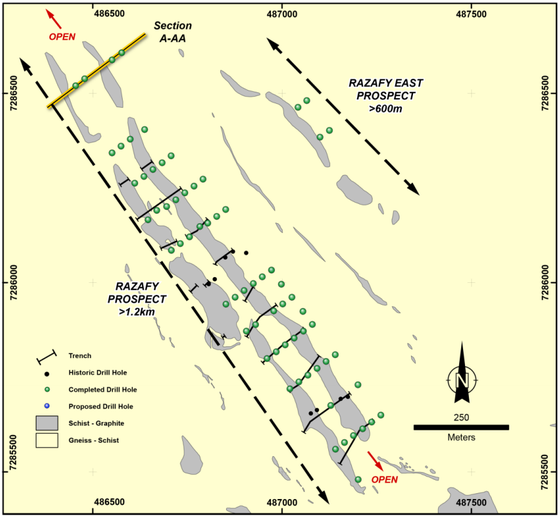 Exploration is underway at the project's Razafy and the Haja prospects, both of which fall within the exploration lease PR39751 and are deemed highly prospective based on results from previous trenching and diamond drilling. 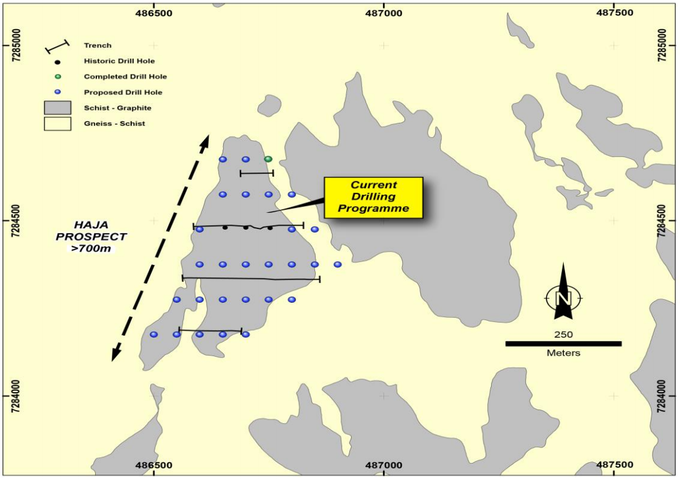 This diamond drill program initially focused on the Razafy area where previous diamond drilling and trenching identified high grade near surface mineralisation. Results from the previous drilling returned the following results with 50 metres of the surface. The Razafy Prospect was originally identified through regional mapping and rock-chip sampling over at least 1.6 kilometres, encompassing six distinct graphite lenses. Results from current diamond drilling have confirmed that the Razafy Prospect, within the Maniry Project area, consists of high grade, thick outcropping graphitic mineralisation contained within distinct lenses which remain not only open along strike but also at depth. Recent identification of further lenses to the east also highlights the prospectivity of the immediate area which, based on mapping and previous exploration, only represents 5% of the current Maniry Project area. On July 5, the company announced that it has received a detailed mineralogical report undertaken by Townend Mineralogy Laboratory on 19 samples taken from the Razafy prospect at the Maniry Project. 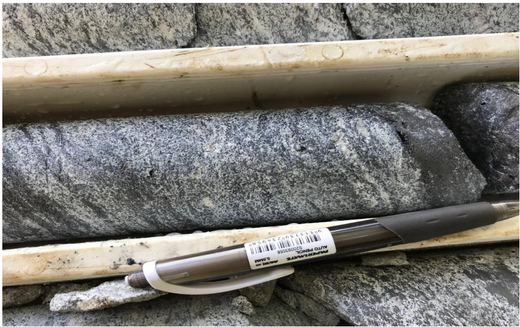 The report, which is consistent with findings from an earlier preliminary mineralogical report confirms that very large flakes (>500 micron) occur frequently within the two drilled and tested lenses currently making up the Razafy prospect. All samples returned significant 500+ micron flakes (up to 2900 micron) and over 60% returned 2000+ micron flakes. Significant flakes exist in excess of 850 microns which attracts a premium price in the expandable graphite market. Due to a current global shortfall in large flake supplies, these results are seen as very encouraging. Jumbo flake sized graphite (>300 micron) typically attracts a significant price premium over fine to large flaked concentrates. The lack of contaminants inside the flakes also suggests the potential for high purity graphite production which is used in higher value end products (including the in-demand LIBs). This is seen as a key component in attracting product sales. Notably, these flakes are free of any deleterious contaminants. The lack of deleterious minerals inside the flakes also suggests the potential for high purity graphite production which is used in higher value end products (Li-ion batteries). These results bolster BEM’s decision to fast track the Maniry Graphite Project. 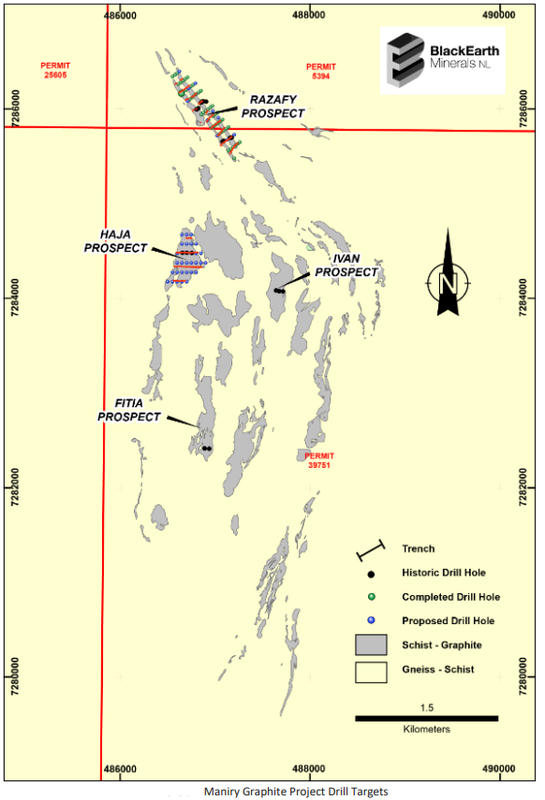 The Haja Prospect, approximately two kilometres south of Razafy, consists of extensive outcropping graphite mineralisation, which has previously been mapped and sampled over a strike length of approximately 800m and a width of up to 275m. While initial drilling focused on Razafy, this will be followed with infill drilling at Haja. Drilling continues at Haja prospect with reports of very wide zones of graphitic schist logged to date. BEM has 28 diamond drill holes planned at Haja for a total of 2000m. Already, around 600 metres of drilling has been completed at the prospect with assays due to follow next month. Previous drilling at the Haja Prospect identified extensive thicknesses of graphite mineralisation including intersections of 70m at 5.3% TGC. With these initial assay results anticipated to be received in mid-August, a maiden Resource estimation for the Haja prospect is expected to follow in the fourth quarter. BEM expects Haja, due to the size of the graphitic lens and consistency of grade, to add a significant amount of graphite Resource tonnes to BEM’s Maniry Resource inventory. Potential investors should note that BEM is still in early stage exploration mode and therefore any decision with regards to adding this stock to your portfolio should be taken with caution and professional financial advice sought. BEM has so far met every milestone it set itself: drill commencement, assay reporting, average daily drill metres and completion of detailed mineralogy. The company remains on target to define a JORC Resource at Razafy within four weeks and complete a scoping study on the Maniry Graphite Project by the end of 2018. These most recent results follow multiple company announcements detailing exploration progress at Maniry. Here The West Australian reports on some of these findings. Located approximately 50 kilometres north of Maniry, is BEM’s 100% owned Ianapera Graphite Project — its second graphite project in Madagascar. 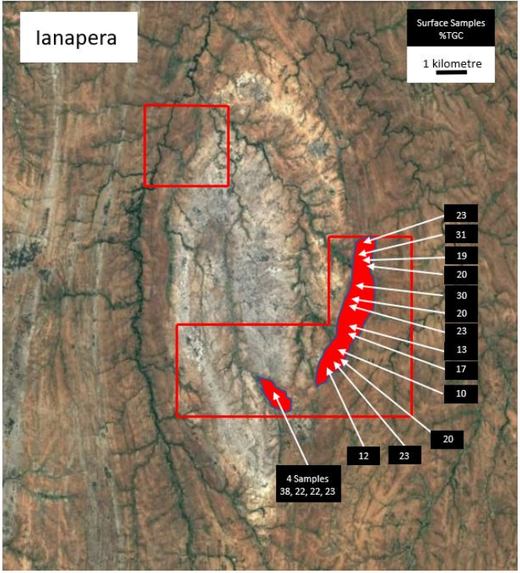 While less exploration has been conducted at Ianapera, it features a series of high-grade outcrops of graphite mineralisation overlaying a large conductive anomaly. Ianapera consists of a series of high-grade outcrops, up to 800m long and 30m wide, of graphite mineralisation within a broader graphite trend. Identified as a large conductive body, potential exists for the presence of a large graphitic mineralised system. As mentioned, the project area lies just five to ten kilometres from TSX-listed NextSource Material’s (TSX:NEXT) Molo Graphite Project. This is a significant point to make as Molo, owned by TSX-listed NextSource Minerals Inc, is a world-class graphite project. Molo has a global Resource of 141.3 million tonnes grading 6.13% TGC, with a contained ore reserve of 22.4 million tonnes grading 7.02% TGC. It has an initial mine life of 30 years, a processing rate of 240,000 tonnes per annum, producing just over 17,000 tonnes of premium graphite concentrate a year, representing up to 3% of the world market. To explore the potential of Ianapera, BEM intend to commence trenching at the project during the second half of this year. This follows what has been described as “excellent” rock chip results that were previously obtained of 10-38% TGC. These samples lie over the top of a large conductive body as defined in the airborne electromagnetic data (VTEM). Over 70% of these samples demonstrate at least 20% TGC. Note that this is the full suite of samples, not just selected results. 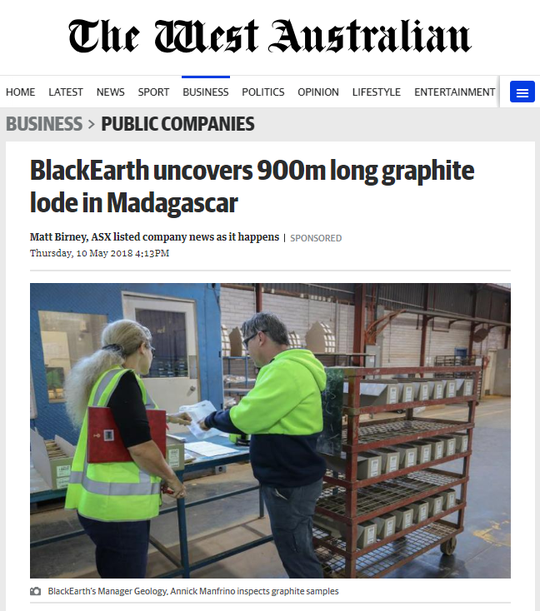 In addition to its Madagascar projects, BEM has graphite exposure in Australia too — although with the opportunity on hand in Madagascar, these are not its current priority. 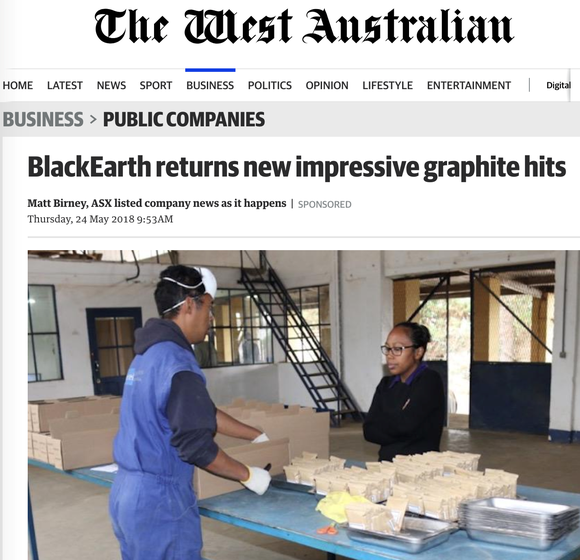 The company’s Western Australian graphite assets include four early stage project areas that have been partially explored by a number of companies in the past, with encouraging results reported from several locations. BEM is currently planning exploration activities on these graphite assets which it expects to implement in coming months. BEM’s Madagascar graphite projects hold promise for the company and its shareholders. While still underexplored, others have proven that Madagascar can host significant graphite projects. For this reason, BEM plan to fast track exploration. Supporting the company’s Madagascar graphite aspirations is its Board and management team that come with the necessary graphite technical skills, African (Madagascan specifically) project development experience, and key commercial and corporate capabilities. The supportive graphite price environment and expected continued demand is another reason to feel confident in the projects’ viability. The company remains on target to define a JORC Resource at Razafy in August, complete a scoping study on the Maniry Graphite Project by the end of 2018 and a feasibility study in 2019. While further news flow will result from exploration at Ianapera, with trenching scheduled for later this year. With plenty on the go — and the team to support it — it may not be long before investors recognise the graphite potential in the now $2.6 million-capped junior.